Some four years ago, a trip to Greenwood (Clark Co., Wis.), then known as "Honeywell's," was regarded as a tedious journey, and was only undertaken in cases of business necessity, and was successfully accomplished only by those who took the precaution previous to their start to fully assure themselves that vehicle, harness and beast were in a condition to warrant a twelve hour pilgrimage over one of the roughest roads to be found in Northwestern Wisconsin; but today the smooth, hard beaten turnpike extending the entire distance and for several miles still further northward, affords the pleasure seekers a most excellent track whereon to enjoy a few hour's drive, and the round trip can easily be made in the "cool of the evening."  Having recently made one of these trips, and being impressed with the great advancement made in the development of our "up river" country, we could not refrain from making a note of some of the most prominent of the many improvements, and with your approval commenced them through the columns of your paper. At Greenwood there seems to have centered a class of businessmen, who but recently formed the nucleus around which is, steadily and surely growing a prosperous village, having for the guarantee of its future welfare, the united efforts of its citizens. A large tract of country, seemingly exhaustless in its wealth of both farming and timbered lands, lies contiguous to Greenwood, and for years will pay tribute to the town's business and commerce. Originally built of hewn logs by Charles W. Carpenter; later sided and used as a store and dwelling by Steven Case Honeywell. Bought in 1870 by "Uncle Steve" Andrews. This engraving was made by Walker of New York from illustration in "Greenwood, Hub of Clark County, compiled by members of the Greenwood Woman's Club. Here we rested our steeds for a moment and interviewed our friend, Mr. William H. Begley, at whose well appointed, large and commodious hotel, the sojourner finds rest and refreshments sufficient to meet his wants, be he ever so fastidious. Begley has divined the necessity of removing from his hotel the liquor traffic, for which purpose he has already commenced the construction of a building on the adjoining lot, the dimensions of which are to be 24x50 feet. The second story of this building will be fitted up as a hall for the accommodation of the public. Mr. B. has also recently added much room to the hotel to meet the requirements of increasing patronage. The pioneer mercantile establishments of the village, Messrs. Chandler and Brown, and Steven C. Honeywell & Son, are doing a prosperous business, and from the completeness of their respective stocks of general merchandise, we should judge were well prepared to cater to the wants of their increasing trade. 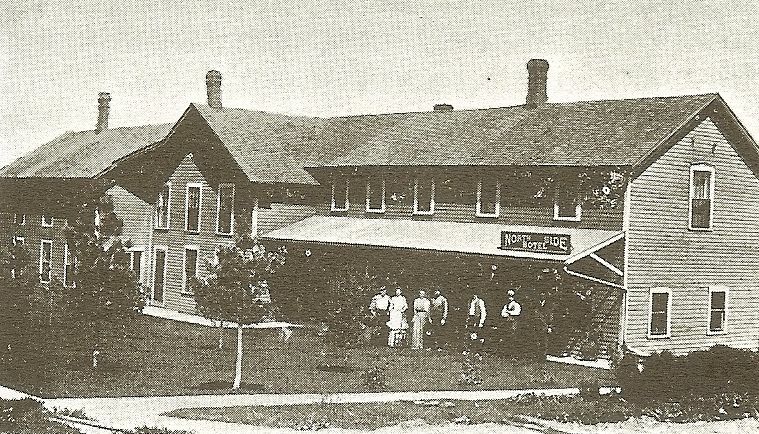 The North Side Hotel (noted on the sign above the people in the photo above), better known as the Begley Hotel, was as the name indicates, located on Greenwood’s North-side. 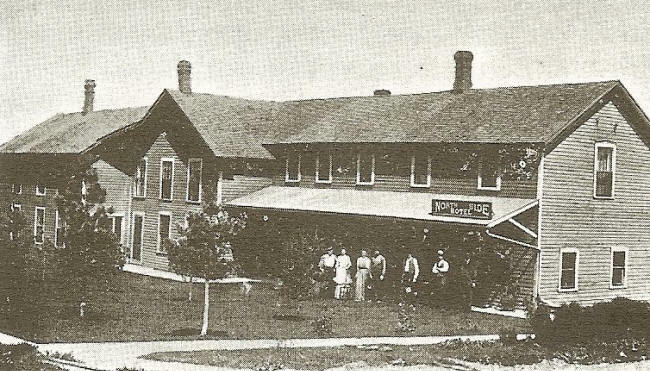 For several years, it was the only hotel in the village. William H. Begley was an early resident of Clark County, one of its pioneers. As well as the hotel business, he was extensively involved with the lumbering business and farming. Upon our entrance into the village our attention was first attracted to the frame of a two-story building, 24x60, and on inquiring we learned that Eaton Bros. of Black River Falls, were hastening its completion preparatory to its early occupancy as a hardware store, and that a complete stock of hardware, tin ware, farming implements, etc., would be kept by this enterprising firm. They will also engage in the flour and feed trade in a building being erected adjoining their store. Mr. Charles C. Bidwell is erecting a large and commodious building to be used as a dwelling and meat market, where he proposes to send "choice cuts," to appease the cravings of hungry customers. Another new building adorns the main street, which is occupied by Joseph Pownder, wherein he handles a full line of confectionery, and shares his room with Mr. N. P. Clark, whose recent espousal of the tonsorial art, has induced him to place at the door the usual tri-colored sign, inviting the unshaven and unshorn to a seat in his comfortable barber chair. Mr. C. J. Burg has recently engaged in the tanning business at this point, and is soon to erect a building suitable for that purpose, which will undoubtedly add much to the improvement of the town, and prove a paying investment. Andy Rogers is soon to engage in blacksmithing here, having leased Mr. Begley's shop for that purpose. Mr. Davis is already engaged in accumulating material for a building 18x24, to be occupied by him as a grocery store. Mr. Robert Govers has recently engaged in the manufacture and sale of household furniture, while Phillip Ramminger, a master workman, is engaged in converting the hardwood timer in which the county abounds, into substantial farm wagons, etc. Mrs. Thos. Pownder has added materially to the village by the erection of a very fine dwelling and barn, which impresses the passersby with the thought that an enjoyable home is the object she seeks in thus tastily arraying and building upon the very pleasant location she has the fortune to possess. Stephen Andrews' new barn and another new dwelling house built this season, the owners name of which we did not learn, are also noticeable features and improvements. This is also the home of then imitable Geo. W. Hubbell, whose ever genial countenance we failed to meet, but we attributed this to the fact of his being strictly a Sunday man, and perhaps on that day had wandered into the adjacent groves for a season of meditation upon thing spiritual or to pluck a plume fro a passing bird's wing with his unerring fowling piece. Greenwood boast of the best schoolhouse in the county, and her citizens have already gained a reputation for the great interest they manifest in their public school and their religious services, which is the best indication of the excellent social states they mentally enjoy. On our return, as the beautiful little village faded in the distance, our attention was again called to the improvements along the road, and the new dwelling by D. Gates, barns and granaries by John Shanks, Geo. And Henry Huntzicker, Albert Brown, Thos. Chadwick, and the very large and handsome residence of Joseph Huntzicker erected last summer, but recently finished, impressed us with the fact that sure prosperity had been fully guaranteed to those who had the required pluck to battle with the dense forests of Clark County, and build for themselves home which should be their pleasure and their pride during the future of their lives. But the most attractive edifice being built by the roadside, is that erected by Geo. Huntzicker, 26x50, two stories high, which is to take the place of the old, familiar log part of the Lumbermen's Hotel, four miles south of Greenwood, which will render that popular house an ornament to the country and a blessing to the weary traveler who chances to jour that way. These few items of improvements are but an indication of the present rapid development which is everywhere noticeable throughout our county, and at no distant day we shall be successfully competing for the rank of the banner county of the state. The people of Greenwood and vicinity have at last got a good bridge, or rather three good bridges, across the three channels of Black river, at Schofield’s mill. The bridges are all substantially built, and will meet the wants of that community for many years. A road running in a direct line from a little south of Chandlers store, in Greenwood, to the bridge, has been cut through, and will soon be put into good traveling condition. A visit of a couple of hours at Greenwood last Friday, gave us a very favorable impression of that enterprising little town. The sound of the hammer and saw are telling its future very plainly and the fall of surrounding trees corroborate their story. The leading mercantile establishments now there are those of Chandler & Brown, which takes the lead, and Honeywell & Son, who also keep a good general store as well as any men living. Though still unpretending, we could not pass Sam Green’s establishment, which would still be an institution worth visiting if set down in the middle of Chicago. Same is a genius, and a philosopher withal, which latter also is Mrs. Sam. Contented with contentment, they have invested their entire fortune they brought back from California in the gun business, and Sam is once more found at the lathe and bench, in a community that appreciates him is we are to judge from the seeming amount of work he had on hand. It could hardly be otherwise, for he is a good workman, with already good and increasing facilities for doing work. Mr. Begley keeps an excellent hotel which will make Greenwood a place of a thousand inhabitants when everything else is in keeping with it. Chandler & Brown are about to put up a large building beside their store to be used as a ware house. A building which will be used for a meat market is nearly completed. There are other buildings in various stages of erection, and strong indications of others to be begun. The little place is evidently having a healthy growth, and will be at no distant day a place of considerable importance. Last Saturday we spent a portion of the day in Greenwood. This was our second visit to that very pleasant and enterprising little town, our first visit having been made about six months ago. Since that time great improvements have been made, and the place now presents an appearance of importance, which it may justly claim. We feel warranted in the assertion that Greenwood does more business than any other town of its size in the state, and that it numbers in its inhabitants a greater number of really reliable, enterprising men that can be found in almost any other place. Taken throughout her inhabitant are of a class that make and retain a favorable impression on all who visit them, and that that quiet little village will yet be a place of importance we verily believe. We shall ever rejoice in its prosperity. Though kindly received by all, we fee, particularly indebted to Messrs. H. W. Begley, H. M. Weston, Geo. W. Hubbell and Dr. Thomas for courtesies extended. Grateful for the favors bestowed, we can only wish for the prosperity of all in return for the kindness shown. At about 10 a.m. last Monday, a fire was discovered on the roof of Lars W. Larson’s residence, in Greenwood. It was learned afterwards, the fire resulted from a defective chimney. The blaze spread very rapidly to all parts of the house. There was a very strong wind blowing at the time, soon spreading the fire to other houses in the vicinity. In less than half an hour, three residences were completely destroyed and several other buildings were burning furiously. By half-past two, the flames were brought under control, but not before ten buildings had been destroyed with nearly all their contents. 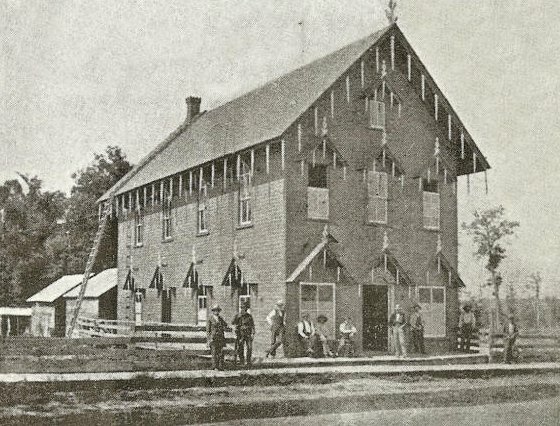 Following are a list of the residences and stores destroyed: L. W. Larson’s residence; L. Johnson’s residence; Frank Brown’s residence; Pfeifer’s Meat Market & Grocery; Elias Peterson’s Shoe Shop and Grocery; Christ Vates’ Saloon, hall & barn; S. M. Andrews’ barn, & Thompson-Root’s barn. Clark Co. Press, May 1885. Excerpt from the Greenwood History, 1934. 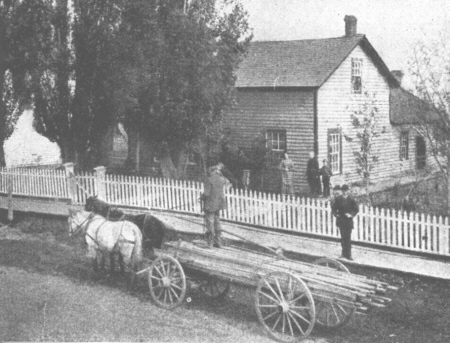 The fire causing the most inconvenience and greatest loss was the fire of May 4, 1885, when eleven buildings were burned in the heart of the town, including the home of Lew Larson, where the fire started from an overheated chimney. Ole Johnson, Sam Greene, Sam Greene's Gun-shop, Frank Pfeiffer's Butcher Shop, Elias Peterson's Shoe Shop, Chris Vates' "Icicle Saloon", which had been purchased from Bob Robinson and moved to about where the little shoe shop of Mikottis’ stands, the barns of Thompson and Root, Elias Peterson, S. M. Andrews, and Christ Vates which he had just filled with hay at $25.00 per ton, and other small buildings were destroyed. There was no fire protection, not even ladders. More buildings might have been burned, but the Black River Improvement Company's crew happened to get to town about the time the fire started and helped fight it with wet blankets, buckets, etc. The, next night, May 5, 1885 it started to snow a heavy wet snow, which by morning was six inches deep, and Kate Miller, who taught school two, miles northeast of Greenwood, waded out to her school. The baby clothes of Ella Larson Crum, who was born two weeks later, were all burned in this fire, as were the clothes and household goods of many others. The Hub of Clark County (1934).